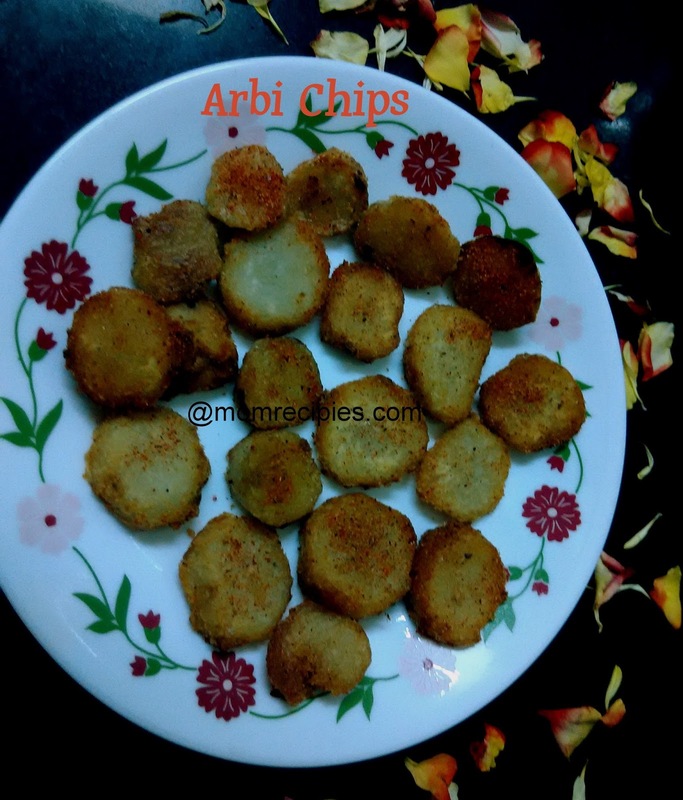 Arbi is an edible variety of tuber well known in India. 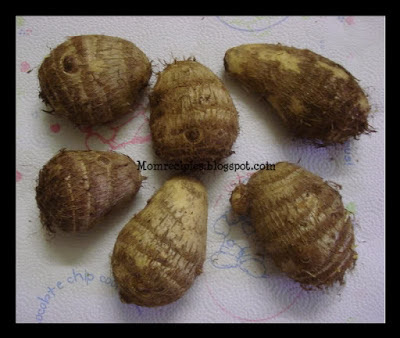 It is known with different names like Colocasia, Taro root ,chamagadda ,Seppankizhangu ,alu and even Elephant ears. There are some families , who consume arbi during fasting or as fasting food. It depends upon family tradition and rules.We usually make this as a snacks or starter or appetizer. 1) First rinse and clean arbi very well. 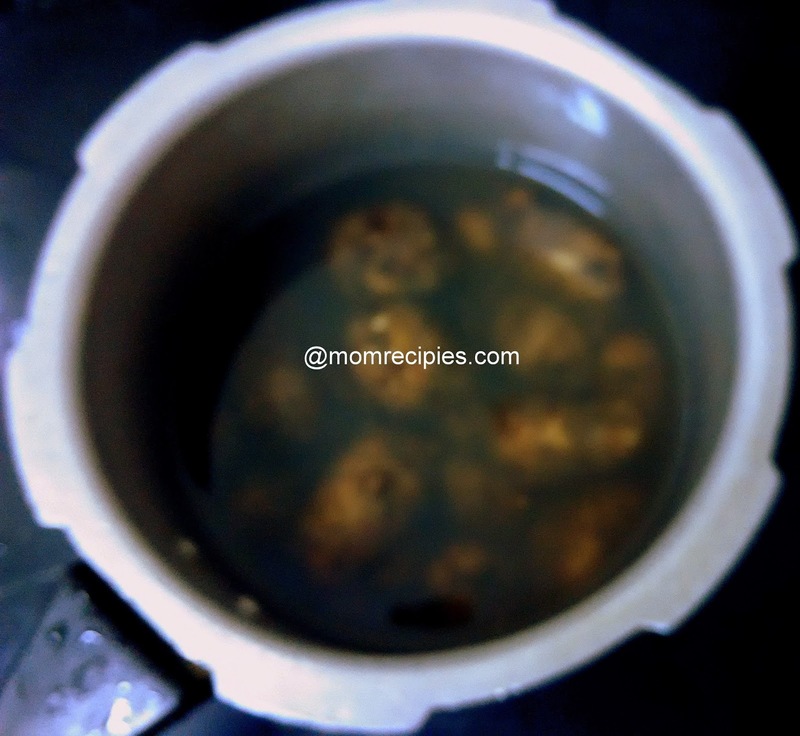 2) In a pressure cooker boil the arbi with enough water until one whistle on medium heat. We want the arbi to be bit under cooked, as the overcooked arbi is mushy, soft and sticky. OR In microwave, it should take only 4-5 minutes. 3)Drain the water .Once cool to touch, peel the skip and discard. 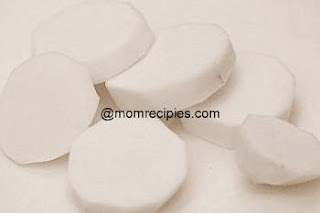 4) Make the slices of peeled arbi. Make sure that slices are not too thin or not too thick. 5) Heat oil in a heavy bottom pan for deep frying. 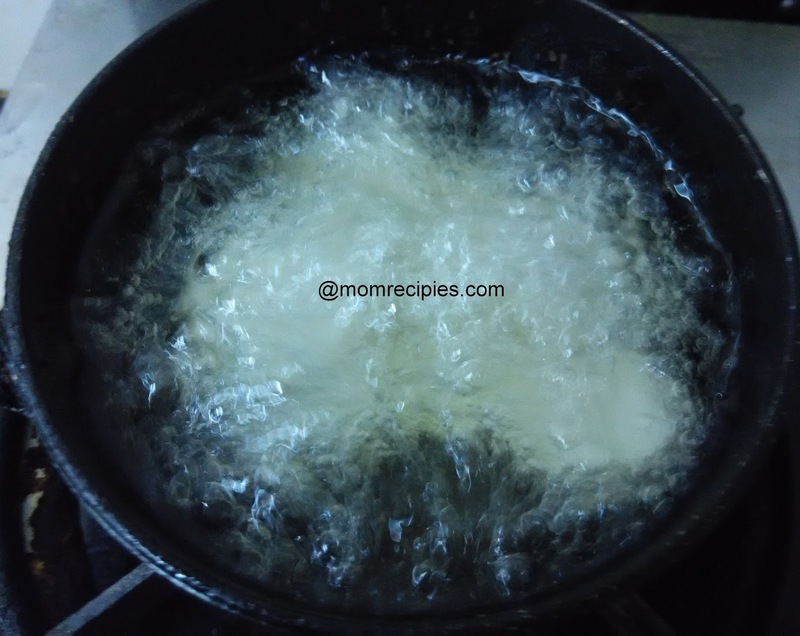 Once oil is hot, carefully add the arbi slices. 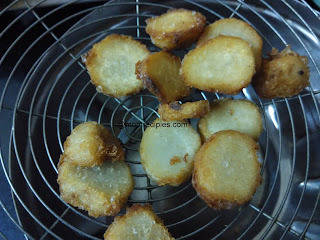 6) Fry them on medium flame.Once it gets golden brown and crispy from one side, flip them and cook another side. 7) Once it is crispy and nicely golden brown from both the sides, remove them . 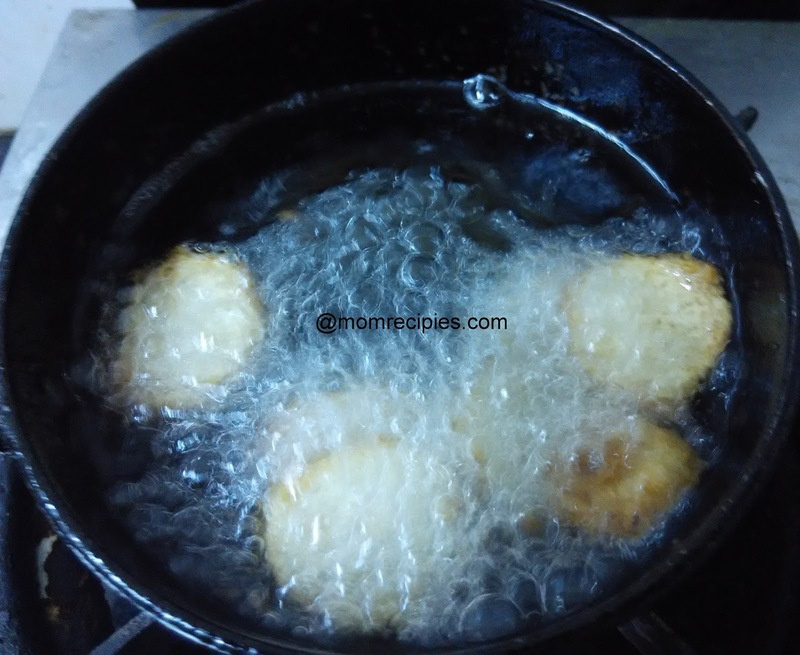 8) Remove them on the paper towel to absorb excess oil. 9) Now add another batch for frying.While the chips from first batch which are still warm sprinkle the spice powders on them. Sprinkle rock salt or sendha namak, pepper or red chili powder, amchur and roasted cumin powder. For the perfect taste, and spices to stick the chips ,the spice powders should be sprinkled while the chips are hot or warm. 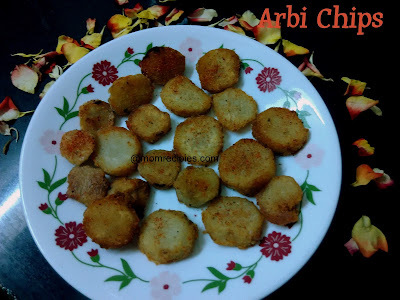 10) Serve the fried arbi warm. As it cools it lose its crispness. 11) Serve as snack or starter or appetizer during fasting or any time of the day. 12) You can have these chips just as it is or with vrat wali green chutney. You can substitute dry mango power / amchur powder with freshly squeezed lemon juice. Just drizzle it all over after sprinkling other spice powders. If you don’t want to deep fry the arbi, you can even shallow fry them which would yield less crispy but nevertheless tasty. If you don't use red chilli powder for fasting then increase the quantity of black pepper powder.